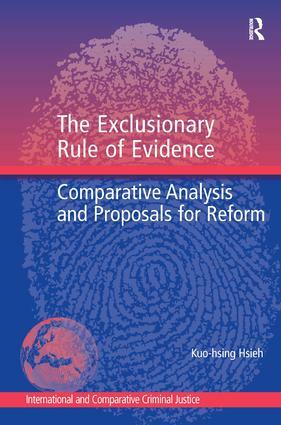 This groundbreaking monograph asserts the need for the establishment of an exclusionary rule of evidence in China as a means of protecting the people from police wrongdoing. The author skilfully explores the foundations and developments of the exclusionary rule in the UK and USA, assessing the rule from a comparative perspective and illuminating some issues that may arise in transferring the rule from one legal system to another. Divided into two parts, the first part discusses lessons from the past, and provides an in-depth examination of the development of the exclusionary rule in the UK and USA, covering rationales, debates and the theoretical foundation of the exclusionary rule in the constitutional context. The second part looks to the future and the establishment of a Chinese exclusionary rule. Specifically, it analyses the effects of police torture, the passive attitude of judges and the need to establish such a rule in practice for future protection of human rights. The author’s experience in criminal law and procedure allow him to adroitly analyse crucial issues on both theoretical and practical level that is understandable to those working in the areas of human rights, comparative criminal procedure, and the Chinese legal system. Kuo-hsing Hsieh is Assistant Professor of Law at the National Chung Cheng University, Taiwan, where his teaching and research focus on criminal law and procedure, and human rights law. He read law at the University of Edinburgh where he received his Ph.D. degree, having been awarded a College of Humanities and Social Science Scholarship, School of Law Scholarship, W.A. Wilson Education Fund and North American Taiwan Studies Association Scholarship. His principal research interest is the broad field of criminal justice, where his work ranges from substantive criminal law to criminal procedure to the administration of criminal justice, with a special focus on issues related to comparative law.